The world today is in search for the new technology and even has contributed certain inventions in the field of science that are none less than miracles. The one such contribution is provided by Nippon Telegraph and Telephone Corporation (NTT). It has announced technology Redtacton. Different services that we see everywhere are genuinely user-friendly and one will require technologies that enable communication between people and objects in close proximity. Focusing on the naturalness, inevitability, and sense of security conveyed by touching in everyday life, this article describes human area networking technology that enables communication by touching, which we call RedTacton. The name chosen for this technology is derived from “touch-act-on” i.e. “action triggered by touching” combined with red, which in Japanese culture is an auspicious color, to convey the cordiality and warmth of interpersonal communications. 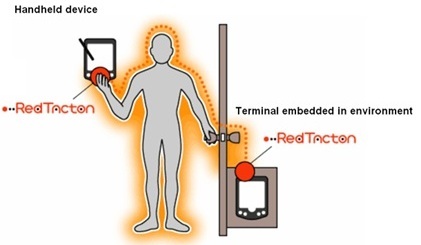 RedTacton is a novel communications technology -neither wireless nor wire communication- that uses the surface of the human body as a transmission medium supporting IEEE 802.3 half-duplex communication at 10 Mbit/s. RedTacton uses the minute electric field emitted on the surface of the human body. Technically, it is completely distinct from wireless and infrared. A transmission path is formed at the moment a part of the human body comes in contact with a RedTacton transceiver. Physically separating ends the contact and the communication starts when terminals carried by the user or embedded in devices are linked in various combinations according to the user’s natural, physical movements. Receiving data is more complicated because the strength of the electric field involved is so low. RedTacton gets around this using a technique called electric field photonics: A laser is passed though an electro-optic crystal, which deflects light differently according to the strength of the field across it. These deflections are measured and converted back into electrical signals to retrieve the transmitted data. Communication is possible using any body surfaces, it can be the hands, fingers, arms, feet, face, legs. RedTacton works through shoes and clothing as well. 1. Communication is highly secure and practically immune from eavesdropping as radio waves are not emitted. New Behavior Patterns: Various conductors and dielectrics can be used as RedTacton communication media, and this has the potential to create new behavior patterns. Security Applications: Automatic user authentication and log-in with just a touch. One To One Services: Enable one-to-one services tailored to the user’s situation and tastes. Intuitive Operations: Natural movements and actions are the trigger. There’s no “operation” any more. Just intuitive human interaction. Device Personalization: Digital lifestyle can be instantly personalized with just a touch. Human society is entering an era of ubiquitous computing, where networks are seamlessly interconnected and information is always accessible at our fingertips. RedTacton is a break-through technology that, for the first time, enables reliable high-speed HAN(Human Area Networking). The advent of RedTacton technology by NTT is in itself revolutionary, which will likely be targeted for use in applications such as wireless headphones, wearable medical devices, security applications, point-of-sale interactions etc. This could get as simple as two people equipped with RedTacton devices being able to exchange data just by shaking hands.